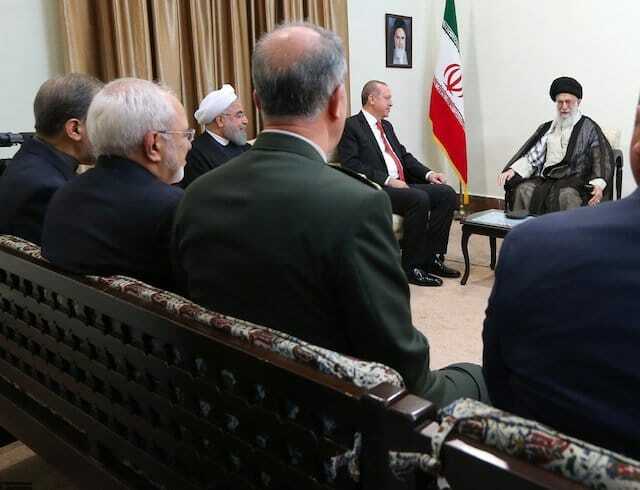 Erdoğan met Iranian counterpart Hassan Rouhani and other senior officials on Wednesday, discussing the September 25 referendum — in which almost 93% of Iraqi Kurds supported independence — and the Syrian conflict. Iran has vehemently denounced any Iraqi Kurdish breakaway from Baghdad, cutting off oil supplies and announcing joint military exercises with Iraq. Turkey has been more moderate in its response, with Erdoğan and Foreign Minister Mevlut Cavusoglu telling Iraqi Kurdish leader Masoud Barzani that “there is a way back” from his “mistake”; however, Erdoğan spoke on Tuesday of sanctions if the move towards independence was not revoked. The Supreme Leader invoked “enemies”, claiming that they and Israel were trying to cause disputes among countries in the region. President Rouhani used a series of appearances with Erdoğan to focus on Turkish links for the recovery of Iran’s embattled economy. An Iranian-Turkish agreement on January 1, 2015, set the goal of tripling trade with tariff cuts on about 300 products. However, the amount fell in 2015 to $9.76 billion, compared to $13.7 billion in 2014. Starting from its first year, the deal led to an awkward outcome: Instead of growing, the trade volume between the two neighbors declined. At the end of 2015, Turkish-Iranian trade stood at $9.76 billion — not only $25 billion short of the target, but also $4 billion below the 2014 figure of $13.7 billion. Despite the lifting of some sanctions on Tehran with the implementation of the July 2015 nuclear agreement, Iranian-Turkish trade in 2016 fell again by $100 million.